Operating pressure up to 210 bar (3000 psi) , Control type with compensator control “C” or “CM”, etc. 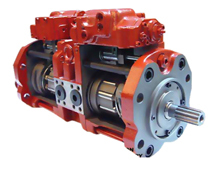 - PVQ piston pumps are in-line, variable displacement units and are available in nine sizes. Displacement is varied by means of pressure and/or flow compensator controls. An impressive assortment of control options offers maximum operating flexibility. - PVQ operates at quietness levels that meet today’s demanding industrial conditions. The sound level of each unit approaches or is below that of the electric motor driving it. Sound is reduced by a patented timing arrangement that also produces low pressure “pulses” in the outlet flow. This leads to reduced tendencies for noise in systems using PVQ. 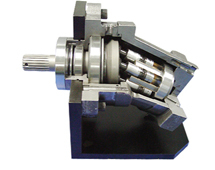 - The PVQ series is capable of operating with many types of hydraulic fluid. Water-content and phosphate ester fluids can be accommodated, in addition to the typical petroleum based and synthetic fluids. 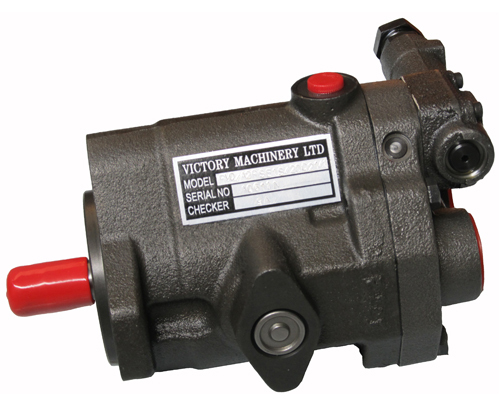 - Many PVQ pumps are available in a thru-drive configuration to accommodate a multitude of application and installation requirements. 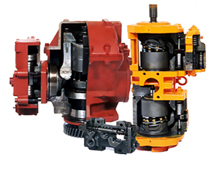 Thru-drive models can be coupled to various types and sizes of fixed and variable displacement pumps, resulting in a compact and versatile package. Such a package offers lower installed cost by reducing the installation size and by requiring only one mounting pad on the prime mover. - Quiet PVQ have excellent operating characteristics, and the pumps many control and mounting options allow choosing the optimum model for any application. Additionally, PVQs possess the same durability and long life characteristics expected of the best industrial products in today’s marketplace. The pressure compensator control automatically adjusts pump delivery to maintain volume requirements of the system at a preselected operating pressure. 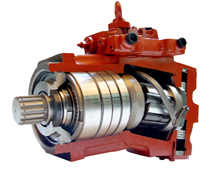 Maximum pump delivery is maintained to approximately 3,4 bar (50 psi) below the pressure setting before being reduced. The pressure compensator control operates on one side of center and has an adjustment range as designated in the model coding. The adjustable maximum stop pressure control enables the maximum pump delivery to be externally adjusted from 25% to 100% while maintaining all of the standard features of a pressure compensated pump. To assist initial priming, manual adjustment control setting must be at least 40% of maximum flow position. Exactly the same as the “C” (pressure compensation option) except the machine operator is able to change the compensator setting through the use of a remote pilot relief valve, such as Vickers C-175. Requirements of the system at either of two preselected operating pressures. Maximum pump delivery is maintained to approximately 3,4 bar (50 psi) below either pressure control setting before being reduced. Control type and pressure range are designated in the model code. The dual range pressure compensator control automatically adjusts pump delivery to maintain volume. This compensator provides load sensing control under all pressure conditions up to the desired maximum. 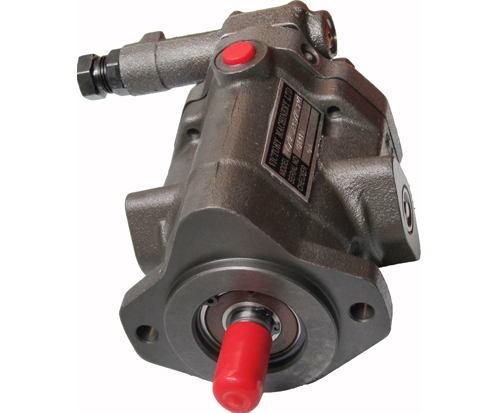 It automatically adjusts pump flow in response to a remote pressure signal and maintains outlet pressure at a level slightly above load pressure. The integral pressure limiter overrides the load sensing control, reducing pump displacement as the preset maximum operating pressure is reached. “C**V11B” Standard load-sensing and pressure limiting control with 11 bar differential pressure (standard factory setting). Includes bleed-down orifice to exhaust load-sense signal for low-pressure standby condition. “C**V11P” Same as C**V11B above, but with bleed-down orifice plugged. “C**VC24B” Same as C**V11B, but with factory differential pressure setting of 24 bar. “C**VC24P” Same as C**V11P, but with factory differential pressure setting of 24 bar.